Rangers counterpart Jeff Banister says he had never seen a balk ruling after umpires didn’t make the call immediately when a pitch was thrown. Kela had already thrown the pitch to Evan Gattis with two outs when Hinch came out of the dugout. Crew chief Sam Holbrook said the umpires stopped Hinch before he could argue to discuss whether Kela had declared that he would pitch out of the windup with runners at second and third. Once the umpires agreed Kela hadn’t made such a declaration, they awarded Springer home. Replay showed Kela (3-3) not pausing in his delivery, and Banister was ejected by Holbrook while arguing the decision. Springer walked to lead off the ninth, went to second on a wild pitch and took third on a flyout by Yuli Gurriel after an intentional walk to Jose Altuve. 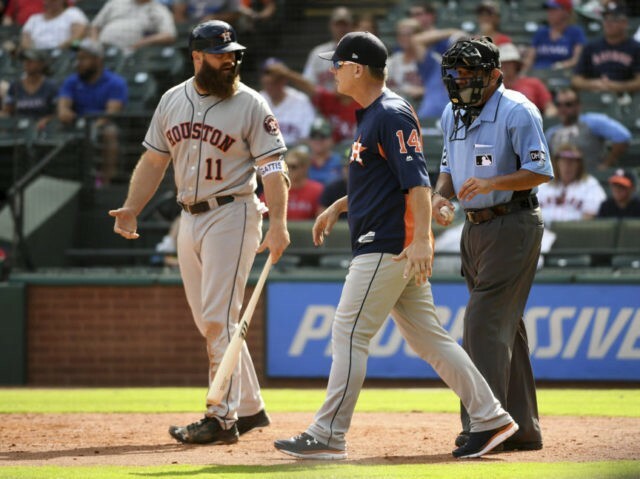 As for the confusion after the pitch to Gattis, Hinch didn’t think there was much of an argument. The 2015 AL Cy Young Award winner couldn’t get through five innings, matching a career worst by allowing 13 hits while throwing 106 pitches in just 4 1/3 innings. Gurriel’s fourth hit was a tiebreaking homer in the seventh, but the Rangers got even again when Nomar Mazara doubled and Adrian Beltre singled him home with two outs in the eighth against Will Harris (2-3). Ronald Guzman’s RBI single for a 6-6 tie finished off Keuchel in the fifth, and the Astros stayed even when lefty Tony Sipp came on thanks to Gurriel’s leaping grab of a liner from Shin-Soo Choo that turned into an unassisted double play at first base. Springer’s major league-leading fifth leadoff homer of the season was his third against Texas, this time against struggling left-hander Matt Moore after the previous two were off lefty ace Cole Hamels. Last year’s World Series MVP leads the Astros with 14 home runs. Beltre had three hits to push his career total to 3,087. The 39-year-old in his 21st season needs two hits to tie Ichiro Suzuki for the most among non-U.S. natives and 21st on the all-time list. Astros: RHP Joe Smith went on the 10-day disabled list with right elbow soreness, and LHP Reymin Guduan was recalled from Triple-A Fresno. The move on Smith was retroactive to Thursday. … SS Carlos Correa was out of the lineup a fourth straight day since leaving a game Wednesday with soreness on his right side. He’s expected to be ready after Monday’s off day. Rangers: RHP Doug Fister went on the DL with a right knee strain. He left his start Friday after throwing one pitch in the sixth inning. Manager Jeff Banister said he expects Fister’s absence to go beyond June 19, the next time the Rangers would need him to take his turn in the rotation. INF Hanser Alberto was recalled from Triple-A Round Rock. Rangers: RHP Bartolo Colon (3-3, 4.16) goes in the opener of a two-game series at the LA Dodgers on Tuesday. The 45-year-old is tied with Hall of Famer Juan Marichal for the most wins by a Dominican-born pitcher at 243.